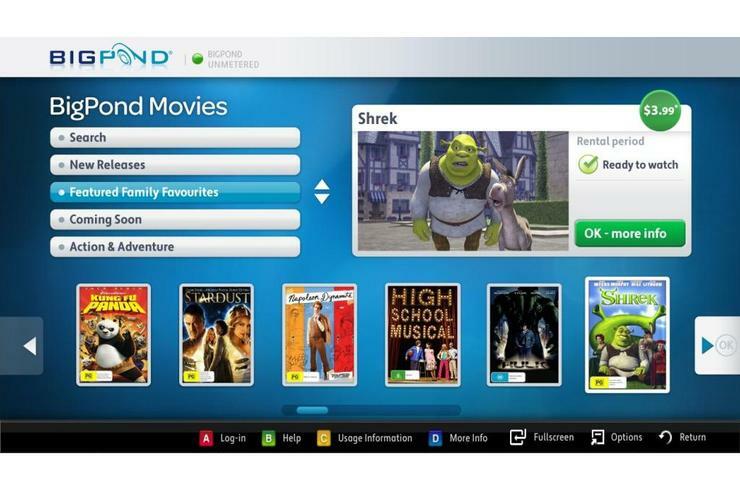 The user interface for Samsung's BigPond Movies on Demand service. New Samsung TVs and home entertainment products released in 2011 will be able to stream BigPond Movies on Demand, with an adaptive bit rate allowing users to view movies and TV shows almost instantly after they are purchased. A demonstration at Samsung's 2011 home entertainment product launch today showed BigPond-streamed movies starting within four seconds of a successful purchase. Adaptive bit rate streaming means viewers can watch movies with little or no delay at initially low bit rate, with quality increasing as the BigPond Movies application tests connection bandwidth and increases the size of the video stream. The BigPond Movies application on Samsung TVs also allows users to fast-forward through content — instead of requiring a full video stream while skipping forward, the service displays a series of still images from the movie in quick succession, lowering download requirements and conserving bandwidth. The partnership between Samsung and BigPond was announced this time last year, and the initial BigPond Movies service was available on Samsung TVs from Christmas Day 2010. The new adaptive bit rate streaming of BigPond Movies on Demand is only available on Samsung TVs, despite the BigPond Movies service also being available on a range of LG TVs — LG's implementation is only able to operate at constant bit rates. A similar adaptive bit rate set-up is available on the Telstra T-Box, which streams TV and movie services over Telstra's BigPond broadband Internet network.